THE SHIVA TEMPLE AT NANDI BHOGANANDISHWARA THE SHIVA TEMPLE AT NANDI BHOGANANDISHWARA - Shiva Maha Purana, Vishnu Purana, garuda purana, bhavishya purana, skanda purana. Nandi is a small town at the bottom of the well known hill resort, Nandi Hills, situated at a distance of about 60 kms. north-east of Bangalore, and is famous for the ancient Shiva temple, popularly known as Bhoganandishwara. The temple as it appears today, is composite. 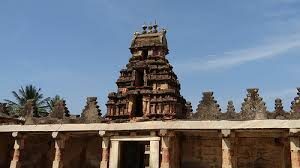 The Chollas, the Hoysalas, the Vijayanagar kings and the Pallegars of the middle ages, all have contributed to the making of this structure. It is of great interest to students of art and archaeology as a pecimen of south Indian sculpture of about the 8th century, and it is fortunately in a good state of preservation, it is considered as one of the most ornate among the Dravidian temples in this part of the state. Several inscriptions of the Chola period are found in the courtyard and around the temple. According to an inscription, it is believed that the original shrine of Shiva was constructed by Rathnavali, the queen of the Bana king Vidyadhara, in the year 804 A.D. A copper plate inscription records certain grants made to the temple by the Rashtrakuta king Govinda. An inscription relating to the 9th century, refers to the reign of the Nolamba king Nolambadhiraja, and records the details of three temples. Judging from the character of the various inscriptions and the style of architecture, the later additions appear to have been executed during the 10 th century. The temple of Bhoganandishwara is a very large structure in Dravidian style, facing east and having a large ‘Mahadeva’. It is a double temple consisting of two separate shrines standing in a line, with two ‘Nandi Mandapas’ in front, and having a small intervening shrine. The north shrine is called Bhoganandishwara and the south shrine Arunachaleshwara. Each temple has spacious halls in front and a fine tower at the top. The pillars of the hall and the ceiling are exquisitely carved with idols on all sides, and with Shiva and Parvati in the central panel. In the main hall is a peculiar figure of Vinayaka, about a metre in height, with a small lion face and a lean proboscis, popularly called as ‘Simha Ganapathi’, which is considered as a rare specimen of its kind. In front of the shrine stands a magnificent four-pillared ‘kalyana mandapa’ built of highly polished black stone. The pillars are beautifully carved from top to bottom with marvellous elaboration of details and exquisite workmanship. The ceiling over these pillars has figures of the ‘dikpalas’ carved in the different tiers. The open hall in the front is supported by twelve polished black pillars, which are very neatly dressed and finely sculptured in three panels all round. Nearby stands a fine stone umbrella with a tall staff. The outer walls of the temple are also carved with friezes of swans and fine figures at intervals. Behind the shrine runs a stone screen with figures of Dakshinamurthy and Nataraja. During the Vijayanagar times, the two Nandi shrines were joined by a shrine of Shiva, known as Maheshwara. To this period belong the shrines of the two goddesses in the ‘prakara’, one for Prasanna Parvathi, and the other for Apitha Kuchalamba. Both the shirnes have a row of large figures carved on the outer walls which represent the marriage of Shiva and Parvathi. To the north of the enclosure is a large square pond known as ‘Shringi Tirtha’, which is surrounded by a pillared verandah having three entrances. A little away from the temple, at the approach to the Nandi hill, is a huge monolith bull, beautifully sculptured. Nandi town can be reached easily from Bangalore by road. Besides the excellent accommodation available on the Nandi hills, there are a few rest houses attached to the temple. The biggest festival at Nandi is held during Maha Shivarathri, when thousands of devotees and tourists assemble from all parts of Karnataka.